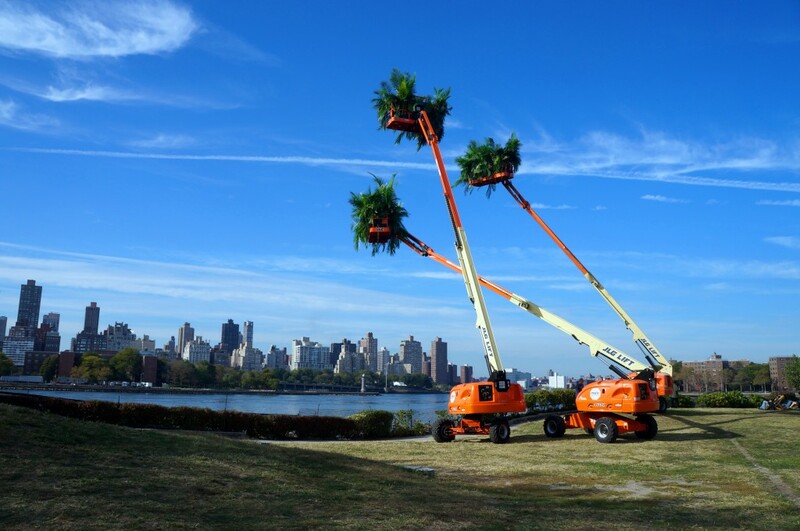 On October 5th, Socrates Sculpture Park was pleased to open Gap Ecology (Three Still Lives with Cherry Pickers and Palms), a new site-specific installation by NYC-based artist David Brooks that made ideas of sustainability and resiliency visible to the general public. Gap Ecology at Socrates was the setting for a panel discussion on urban environmental action with David Brooks, Claire Weisz, FAIA – a founding principal of WXY architecture + urban design, and Mary Mattingly – a visual artist whose work collapses the boundaries between performance, sculpture, architecture, and documentation. becoming a roving installation that moved to a new location in the park each week. This installation and event was part of Marfa Dialogues/NY, a two-month series of events in October/November 2013 that examined climate change through the lens of culture, bringing together disparate audiences across New York City by combining science, activism and artistic practice. 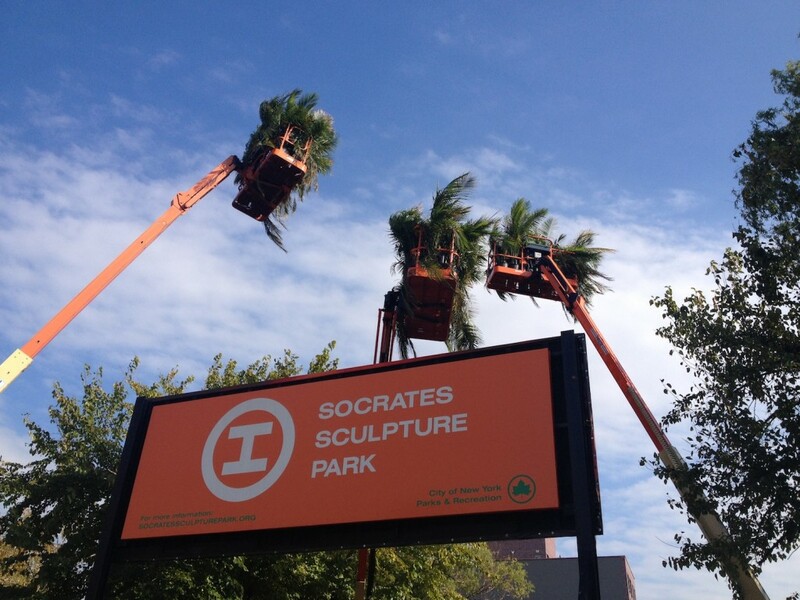 Socrates Sculpture Park was selected by the Robert Rauschenberg Foundation to participate in Marfa Dialogues/NY. In considering its own ecological history, from former landfill to current waterfront park, Socrates commissioned Brooks to probe social and environmental concerns. Brooks’ response, Gap Ecology, was a play on opportunistic ecology that combines ideas of environmental evolution with the park’s post-industrial landscape. 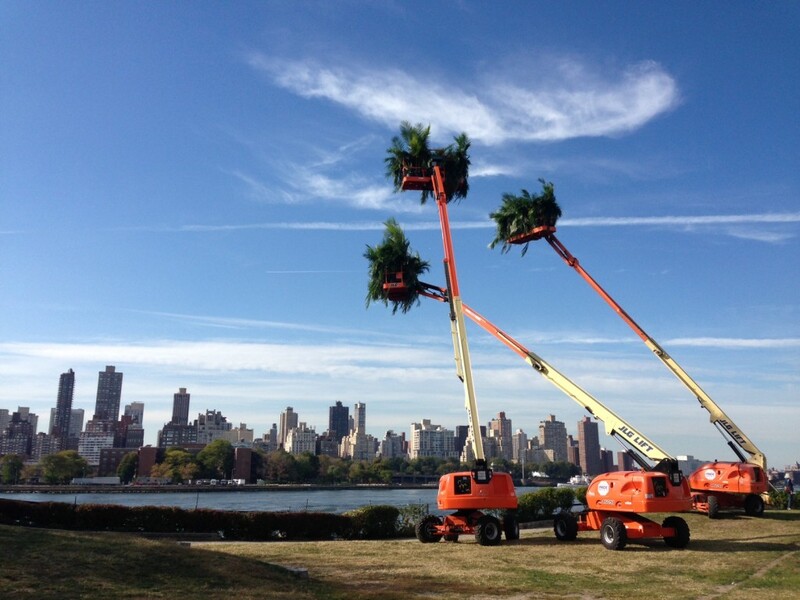 As we approached the first anniversary of Superstorm Sandy, the natural disaster that flooded the park and surrounding communities in October 2012, Gap Ecology served as a thought-provoking yet absurdist gesture that seizes this dramatic moment for New York City to raise important questions and allow more people to consider environmental opportunities for the present and future. 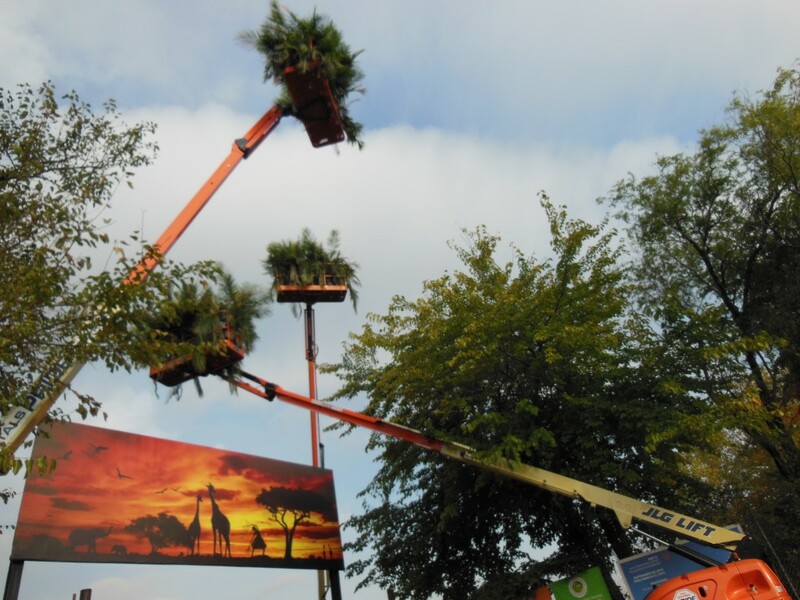 GAP ECOLOGY was a conceptual, large-scale installation of three 60’ boom lifts, or cherry pickers, machinery that is ubiquitous throughout the urban landscape. 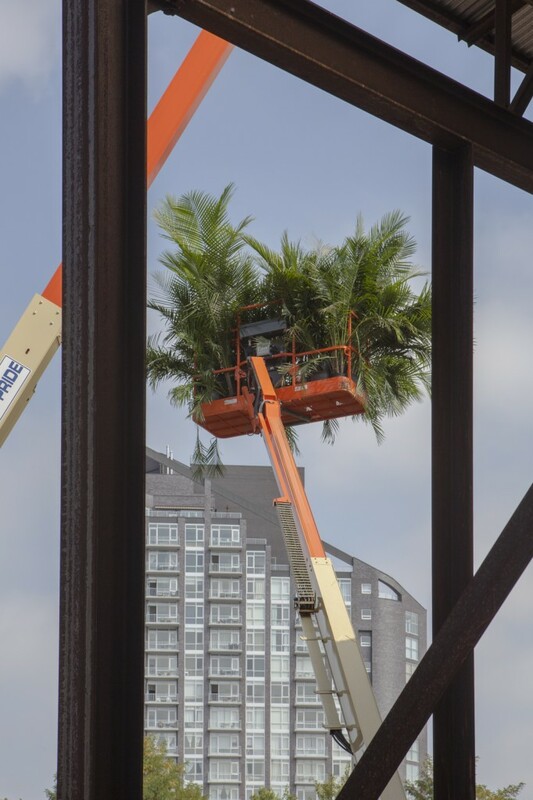 In contrast to this symbol of new construction, Brooks “greened” the lifts, filling each suspended basket with lush plant life, ranging from palms, bamboo and various shrubberies. DAVID BROOKS is an artist whose work considers the relationship between the individual and the built and natural environment. His work investigates how cultural concerns cannot be divorced from the natural world, while also questioning the terms under which nature is perceived and utilized. 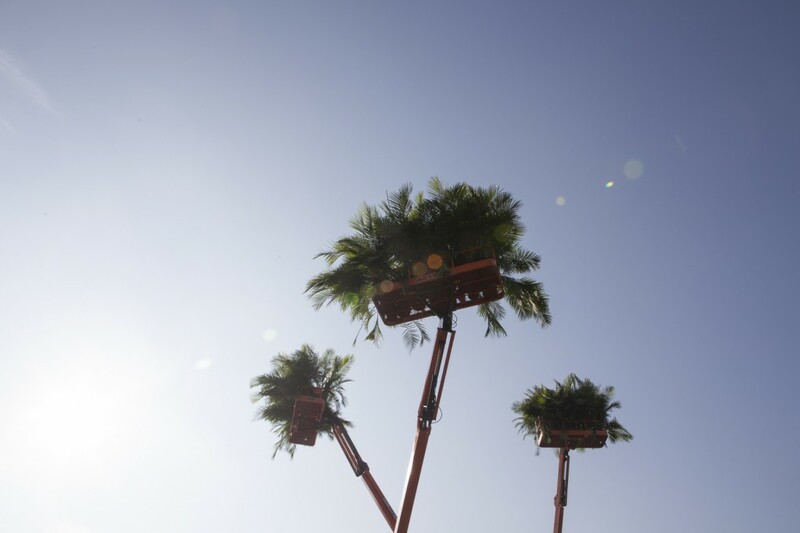 Brooks has exhibited at the Miami Art Museum; Dallas Contemporary; Nouveau Musée National de Monaco; Bold Tendencies London; Sculpture Center, New York; and MoMA/PS1 where he had a two-year major installation. In November of 2011 Brooks opened Desert Rooftops in Times Square, a 5000 sq. ft. earthwork commissioned by the Art Production Fund. His work has also been exhibited nationally and internationally at the Changwon Sculpure Biennale in South Korea; Blank Beijing China; Galerie für Landschaftskunst, Hamburg; James Cohan Gallery Shanghai; as well as Gavin Brown’s Enterprise; Tanya Bonakdar; and Marlborough Chelsea; along with major commissions by the Cass Sculpture Foundation and Storm King Art Center. Brooks received his BFA from the Cooper Union and his MFA from Columbia University. He lives and works in NYC and is represented by American Contemporary. MARFA DIALOGUES / NY is an examination of climate change science, environmental activism and artistic practice happening this October and November, 2013 in New York City. A collaboration between the Robert Rauschenberg Foundation, Ballroom Marfa and the Public Concern Foundation, Marfa Dialogues / NY featured 18 Program Partners and a spectrum of exhibitions, performance, and interdisciplinary discussions at the intersection of the arts and climate change. This 2013 Marfa Dialogues/NY was made possible by a grant from the Robert Rauschenberg Foundation.